Mark Frauenfelder has a wonderful post up over on the Dinosaurs and Robots blog showing off the automatic chicken coop door opener he's created. Frauenfelder's solved the problem of having to get up at the crack of dawn to let his anxious chooks out of the coop and into the run: the door operates on a timer that opens promptly at 6:30am to release the girls to go about their day in the run. He's also got the timer set to close the door again at 9pm after the girls have gone to sleep. It's perfect for those of us who aren't close to home at dusk due to work or other activities. Want to make one of these for your coop? The complete instructions (including diagrams and photos) are posted over on BuildEazy: Automatic Chicken House Door. If necessity is the mother of invention, I think it's only a matter of time before someone creates an automatic egg butler that will collect eggs from the coop and bring them to your table, cooking them to order on the way. 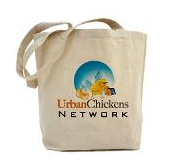 Know of any other cool urban chicken technology? Share the lead and I'll write it up here in a future post with a hat-tip to you. That is awesome! Thanks for sharing. I forgot just how upscale you can get with these birds.It's been more than 20 years since I've raised chickens and that was in a fairly rural location where you pretty much let the birds fend for themselves in a larger fenced in area. Now that I'm a "new" urban chicken farmer with three birds on a 1/10-acre lot (including house), I have to get a bit more creative with my coop architecture. I need one of these so I can sleep in on the weekends. That is such a cool invention. This puts me one step closer to actually getting chickens. 1) Husband would get to "build" something - he likes that and 2) If I were gone he could still sleep in and they'd be fine.